New Addition: Why Roofing Really Matters for Norton Remodels | Boss Services Inc.
Do you know what the most important part of an addition project really is? Some might think it is the foundation or the type of materials that you use, but the truth is that your roof system solution and how you tie it into your existing home, is what really matters the most. If the goal is to make your new addition look as though it is part of the original structure, the key lies in how you do your brand new roof installation. The best way to get the best possible results is to hire professional Norton construction and remodeling services, such as Boss Services, Inc., to handle the entire addition project. Boss Services, Inc. provides a wide range of quality remodeling services in Norton and the surrounding Massachusetts area, including roofing. The roof line is really the first thing that people notice when they come to your home. If the new roof does not blend well with the rest of the house the whole project will look like you just stuck a room on the side of your house. So if your goal is to have seamless results with your new addition, it is important to pay attention to the type of roof that you put on the new room and how it ties in with the rest of your home. Work with your Norton construction and remodeling professional to find the very best roof system solution that is right for you and your home. Gables – Instead of adding on just a single slope to continue your existing roof, a gable roof brings together two slopes that meet at a peak that runs down the middle of the roof. 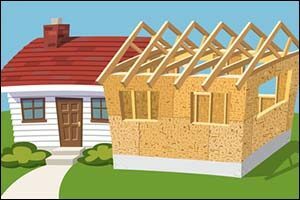 It not only helps to tie your addition into the existing structure in an interesting way, but if is designed to fit the angle and proportions of the rest of the roof, it will look like it was always a part of your home. Speak with your remodeling services in Norton to find out if this type of brand new roof installation is the best solution for the addition. Dormers – Using the same idea as the gable roof, a dormer is similar to a gable, however it is a smaller version that projects at a 90-degree angle off of the main roof. It is designed to typically hold a window or two, adding even more character to your home. This can be an excellent choice for second story additions, as the dormer allows you to raise the ceiling instead of using lower eaves. Multiple dormers can be used to tie the roof from the original portion of the house to the addition, if necessary. Extension – A simple extension is another way to go, especially if your addition is on the gable end of the house. This makes it easy to just extend the roof line that is already in place and connect it over the new room. This is a low-cost roof system solution compared to other methods, yet still allows you to tie the new roof in with the rest of the structure. Speak with your Norton construction and remodeling professional to find out if a simple roof extension is the best choice for your home. Shed – If you want a super simple solution for your brand new roof installation, choose the shed roof. This is just a very simple, single slope, that is attached at the high point of the original structure that slants to the end of the addition. This is a very easy build and is preferred by many contractors, however you should consult with your remodeling services in Norton to find out if this is truly the best solution. Picking the easy way isn’t always the best way, as this method can make the addition stick out and won’t allow it to flow as seamlessly with the rest of the house as other options would. It is important that you work with a contractor for your addition project that has experience working with roofing in Massachusetts. Knowledge of the best options for a roof system solution that will seamlessly tie into the existing structure is extremely important if you want the addition to look like part of the original design. Call Boss Services, Inc. at (508) 297-0635 to get a QUOTE for your remodeling services in Norton and the surrounding area.